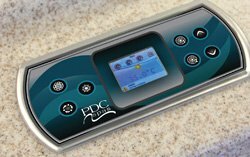 You can rely on the PDC Spas digital control centers to operate your spa flawlessly with our advanced technology and easy to operate features. Customize your spa operation with programmed ideal temperatures, filter cycles and pump performance for a worry- free, easy to maintain hot tub. All PDC Spas hot tub controls offer a dependable operation center for your hot tub in any weather condition. 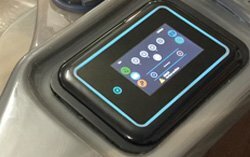 The LCD, waterproof control technology assures your hot tub stays cleaner, runs efficiently, requires minimal maintenance, with reliable, user-friendly operation. Freeze and over-heat protection, auto filtration cycles, system purge, auto shut-off and self-diagnostics are all included with each control. Standard on all Luxury Series spa models, this menu-driven touch screen control features an easy to read LCD screen, controlling water temperature, pump operation, lighting features, clock settings, filter cycles, Air'assage™ and more. 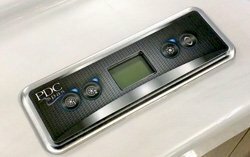 PDC Spas is proud to offer this recent technology, similar to an iPad or tablet for familiar ease of use and reliability. The backlit screen is a great feature for nighttime spa soaking in this menu-driven state-of-the art control. All LifeStyle Series spa models feature this simple to operate control center. The in.k300 backlit digital control is easily programmed to operate hot tub features and settings,, such as lighting and temperature and pump power. Be confident your LifeStyle Spa will operate with reliability for years of enjoyment. An optional control feature offered on all Luxury and Premium Series spa models, you can enjoy remote spa operation from anywhere thanks to the internet. Turn any feature on and off, adjust temperature, change filtration modes, set customized themes – all controlled from your smart phone, tablet through an app. Anywhere there’s an internet connection, there’s hot tub control. *Free local connection app. Worldwide connectivity requires modest cost app purchase.